But what is it about Cuisinart's 11 inch Grill Pan that makes it green? 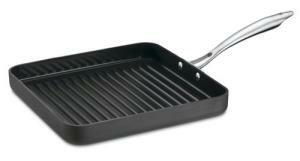 The hard-anodized aluminum square griddle is not in itself a new idea. But the scratch-resistant nonstick ceramic-based surface does offer something new. The water-based Ceramica, a nonstick surface that won't peel off, is free of PTFE and PFOA. This allows the griddle to be heated up to 500 degrees F without worries of PTFE degradation causing you flu-like symptoms or PFOA being a carcinogen. It also means the griddle is oven- and broiler- safe. Additionally, superior heat conductivity means less energy use. And the securely-attached, stay-cool stainless steel handle is made of 70 percent recycled stainless steel. Energy conservation and recycling are about as green as it gets. The new cookware conforms to FDA and European RoHS standards for environmentally sound products. Cuisinart is even getting some "green" kudos for the grill's packaging which is made from 100 percent recycled materials and printed with 100 percent biodegradable soy ink. Perhaps it's time that being green is just par for the course.